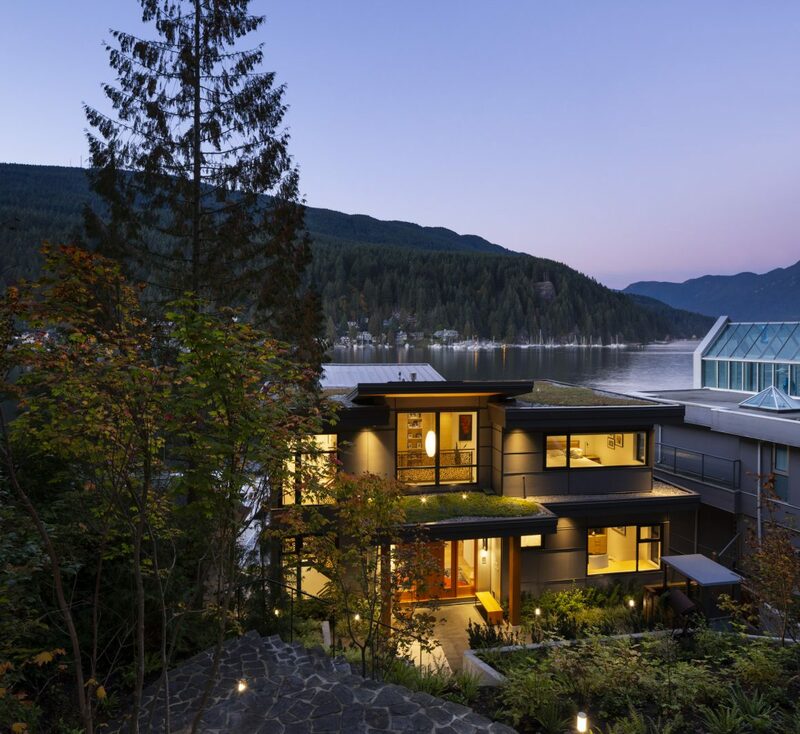 The “two heads are better than one” effect doubled when it came to the design of this striking newly built home in the coveted Deep Cove area of North Vancouver, B.C. 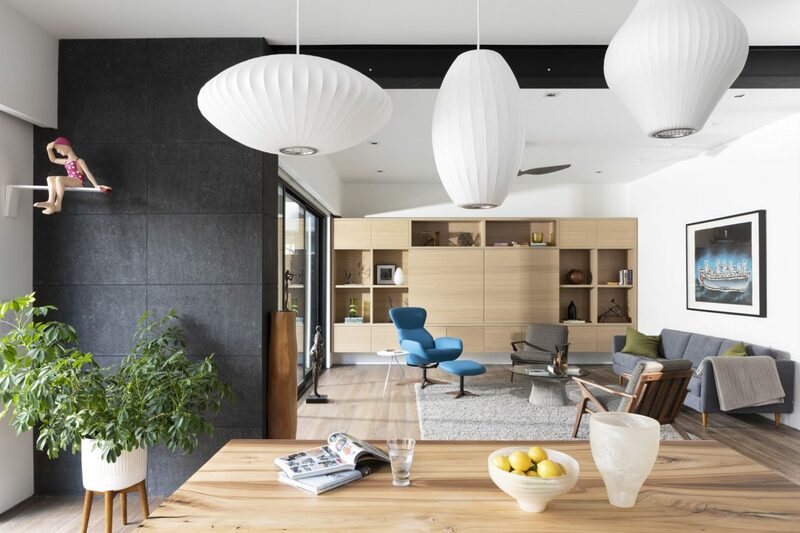 The owners – David Evans, a retired real estate developer, and Susan Kagan, a legal assistant and part-time artist – played a big role in designing their 4,100-square-foot home. And they worked closely with another couple who are partners in life and work: Lynda and Curtis Krahn, co-principals of Synthesis Design. 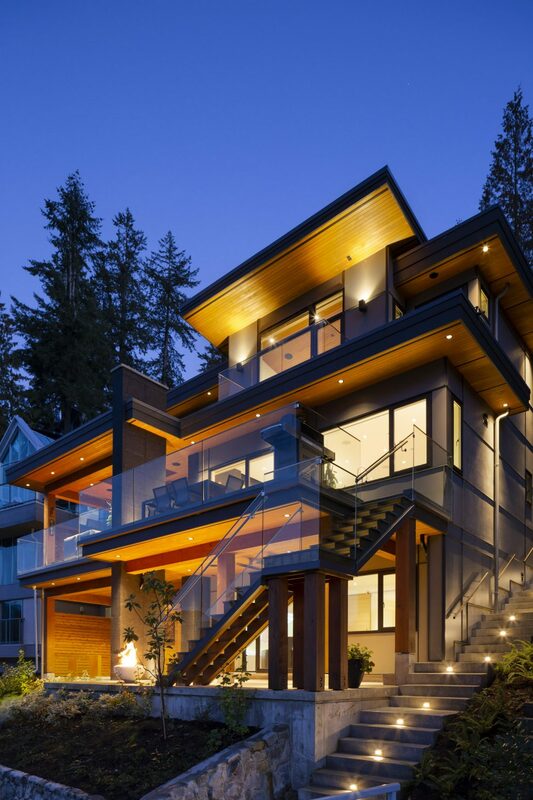 They headed up the design of the house both inside and out. Synthesis Design co-principal Curtis Krahn designed the home to be as striking when viewed from the street level above as from the dock below. A green roof helps it blend into the surrounding greenery. 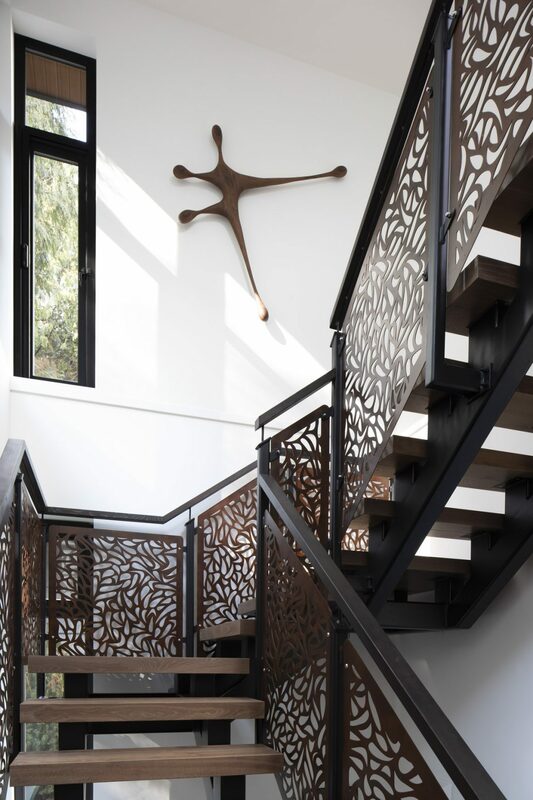 The staircase, co-designed by the homeowners, is complemented by the wood sculpture mounted on the wall. Sculpture: Celebration by Federico Mendez-Castro; staircase: Marcon Metalfab. David and Susan each have two adult children from previous relationships, and were ready to create a space just for themselves. And both possess keen eyes for design, says Lynda, along with a sense of fun. They also wanted to showcase the metal sculptures made by Susan and pieces from her art collection. Light floods the second floor open hallway leading to the three bedrooms. 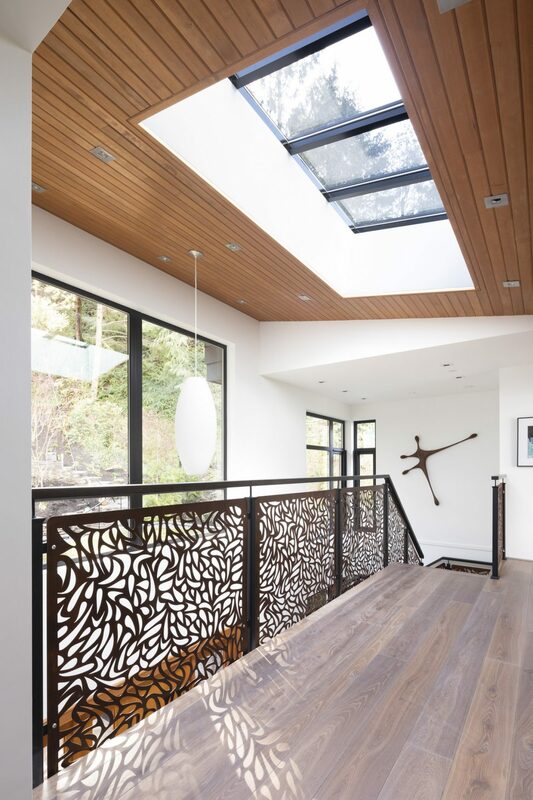 An ample skylight sets off the ceiling, which is clad with hemlock. “As well, David and Susan are unassuming people who wanted the house to blend in with the environment,” says Curtis Krahn. The effortless grace of the finished project’s architecture belies what was to prove a very difficult birth. 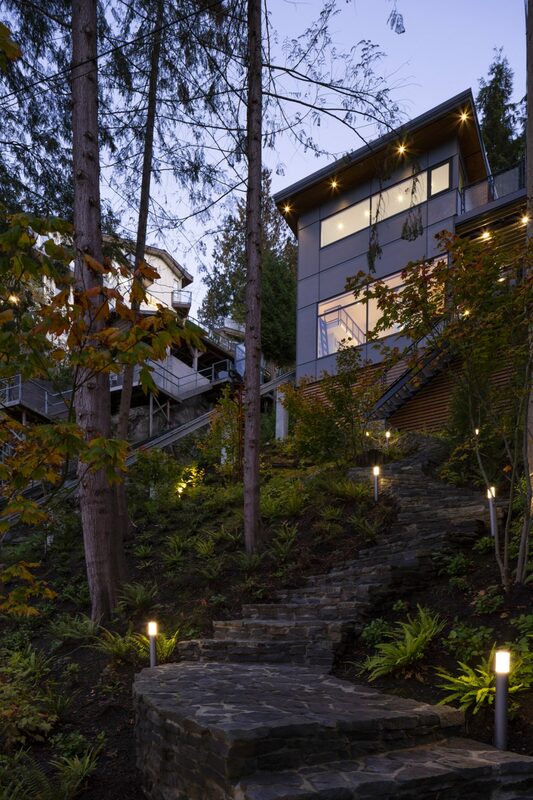 David had fallen in love with a waterfront site with an exceptionally steep slope. It would take more than twice as long as usual — well over two years — to devise a plan that would be approved by city council. That meant calling in structural and environmental engineers, as well as wildfire experts and slope hazard specialists. 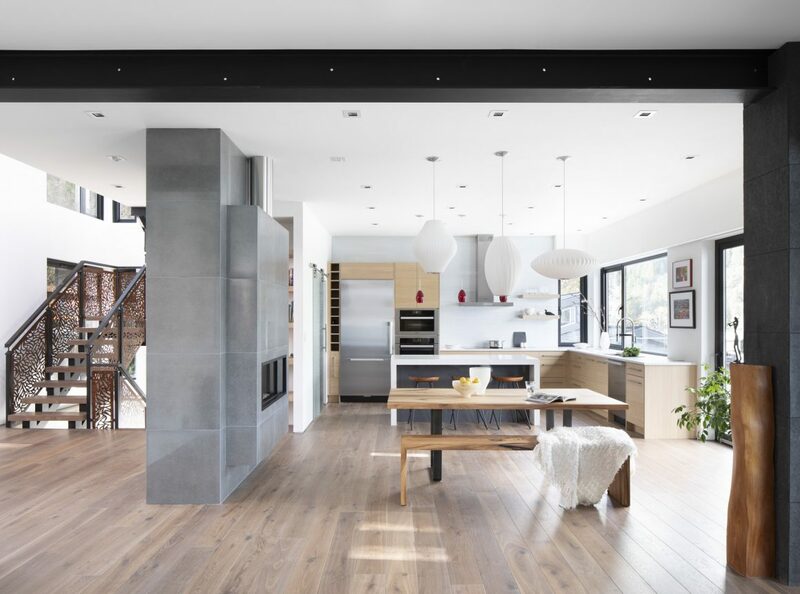 The massive fireplace feature helps define the kitchen and dining area, creating a sense of intimacy without sacrificing the open-concept look. Fireplace cladding: Metallo glazed porcelain tiles in Inox by Stone Tile. The Synthesis Design team included Kevin Li, director of design, and Slavica Paulic, senior interior designer. The project contractor was Naikoon Construction Ltd.
With a 108-foot drop from the road above to the water below, there was the issue of getting building materials to the site. Many were shipped in via barge, and a tram was later installed to transport them. It remains in place for the use of residents and visitors who don’t want to brave the stairway’s 101 steps leading to the front door. The kitchen’s minimal design functions beautifully on family nights and when the homeowners entertain. Recessed and pendant lighting creates ambience at night. Appliances: Miele; island pendant lights: Firefrost in red translucent Murano glass by Tech Lighting. Eventually, the home was built on three levels, with three bedrooms and master ensuite on top, living areas and home office on the second floor, and laundry and golf simulator at water level. David was especially keen that the house be situated close to the water. Being sociable by nature, he wanted to be able to interact with the many kayakers who use the bay. “As well, this placement made the roof a very important design element, because it is all you see when looking down on the house from the road above,” says Curtis Krahn. Sliding patio doors create a seamless flow to a covered deck off the living room. Small metal sculptures: by homeowner and artist Susan Kagan; custom cabinetry: Duke Custom Kitchens and Architectural Millwork; cabinetry material: prefinished wood panels in Ivory Oak by Shinnoki. In the end, a green roof was decided upon, an attractive option that also helps insulate the home and reduces air pollutants. A modern flat-roof design with offsetting shed roofs was used. And for David, an avid golfer, the plantings in two areas are configured to mimic Pebble Beach golf greens. Susan also has an area designed just for her, a studio under the garage that juts from the cliff. The front door faces the back of the large fireplace feature, which is clad in deep-grey porcelain tiles with a metallic sheen. Curtis Krahn says he used a technique employed in classical Italian landscapes of placing an obstacle, thereby enticing people to choose a path around it and explore. On each side of the imposing structure are glimpsed tantalizing and spectacular views of the bay, afforded by the 40 feet of windows beyond. On the other side lie the dining area and kitchen that lead into the living room with adjacent deck area. 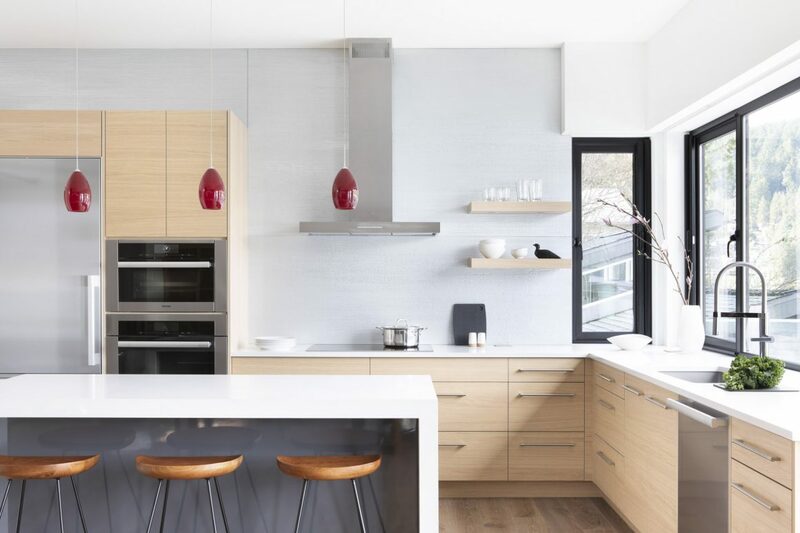 The custom kitchen was designed to keep the look as minimal as possible, says Lynda Krahn. “As with the rest of the home, it was designed to highlight the architecture and the owners’ artwork.” Two floating shelves hold ornamental items; everything else is tidily hidden behind closed doors. A pantry off to the side holds small appliances – a coffeemaker and so forth – so counters can be kept clear and uncluttered. 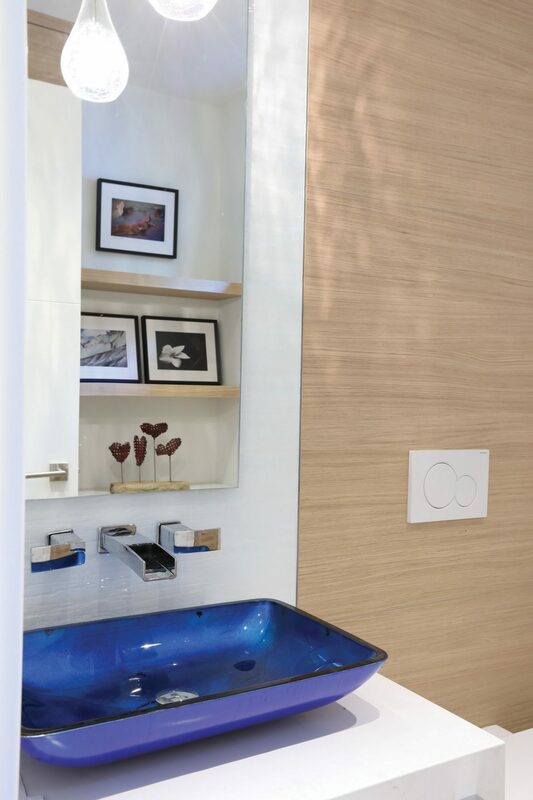 Colour is used judiciously throughout the home, as in the main floor powder room’s cerulean-blue vessel sink. Sink: Irruption by Kraus. The cabinetry is one of the home’s star features. It is crafted of pale oak prefinished wood panels with vertical striation that creates a distinctive texture. In addition to being used in the kitchen, it appears in the master bathroom and powder room cabinets. As well, it covers the wall of built-in shelving in the living room, with sliding doors that hide the seldom-used television. 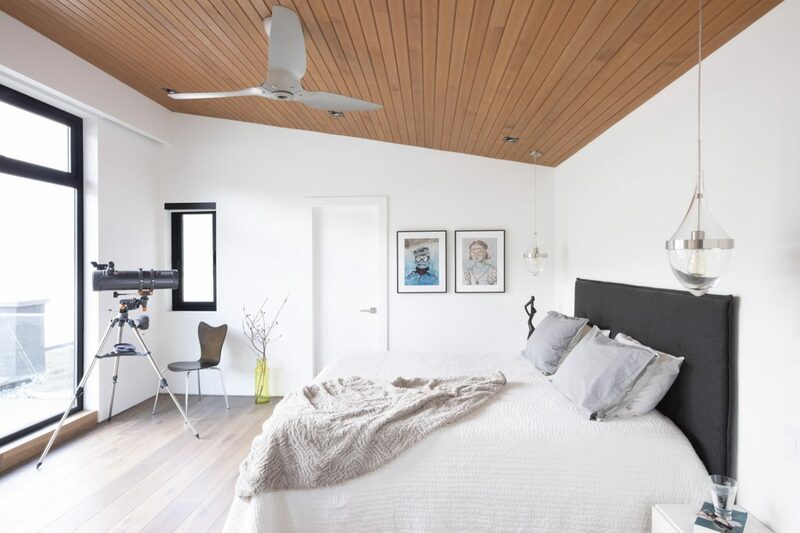 The subdued soft grey-and-white colour palette was continued into the master bedroom. “We also brought the outdoors in by incorporating lots of wood and natural stone into the interior design, which also helped create the warmth that this couple wanted,” says Lynda Krahn. Exterior soffits were faced with hemlock, and the feature extended into the master bedroom and the ceiling over the main stairwell. The front door is made of natural fir played against medium-toned engineered oak flooring that runs throughout the home. 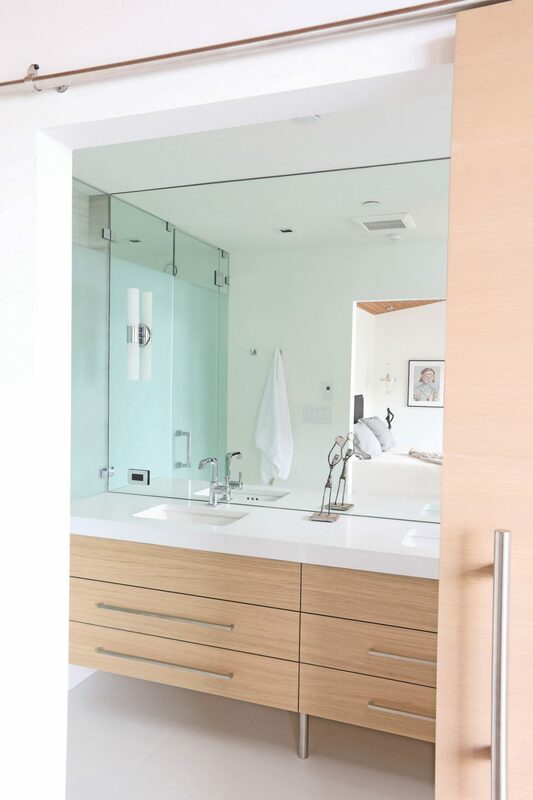 In the bathrooms, natural limestone forms a counterpoint to the pale-oak contemporary cabinetry.